This image, taken by the Viking 1 orbiter in 1976, has been used by scientists to pinpoint the location of the Sagan Memorial Station. The lander is positioned at the center of the blue " rays,"and North is at the top. The prominent twin hills dubbed " Twin Peaks"are west of the lander, and the prominent large crater dubbed " Big Crater"is at center. The small crater at the north border of Big Crater, dubbed " Rim Shot Crater,"and " Little Crater"were features that helped scientists accurately identify the location of the lander on the Martian surface and are shown in the two insets. The spacecraft landed successfully within its original target ellipse, which measured 100 km (62 mi) by 200 km (124 mi). Mars Pathfinder is the second in NASA's Discovery program of low-cost spacecraft with highly focused science goals. The Jet Propulsion Laboratory, Pasadena, CA, developed and manages the Mars Pathfinder mission for NASA's Office of Space Science, Washington, D.C. The Imager for Mars Pathfinder (IMP) was developed by the University of Arizona Lunar and Planetary Laboratory under contract to JPL. Peter Smith is the Principal Investigator. 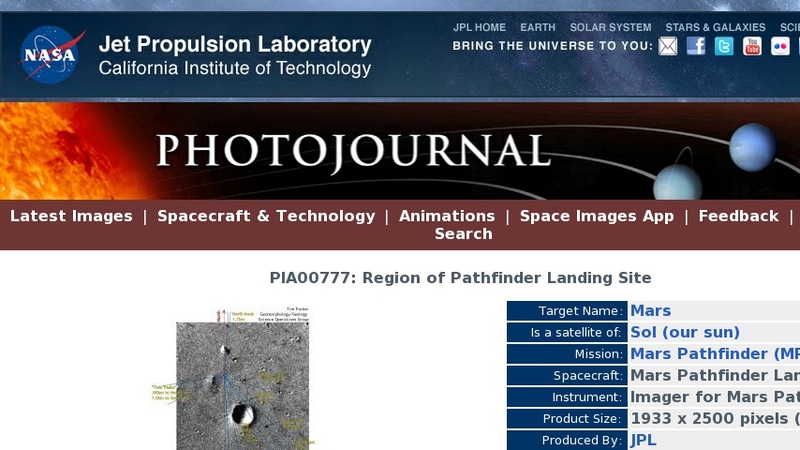 JPL is an operating division of the California Institute of Technology (Caltech).